Can the surviving journalists of the satirical magazine, Charlie Hebdo, really forgive the terrorists who last week brutally murdered ten of their colleagues and others at their Paris office? Al Queda claimed that the attack was "revenge" for Charlie Hebdo's depiction of the prophet, Mohammed. But following the gruesome killings, millions in France and across the world marched in protest and proclaimed "Je suis Charlie" in support of freedom of expression. And today, millions are buying the latest edition of the magazine rapidly put-together by the few surviving staff. Today's front cover of Charlie Hebdo, however, defiantly shows yet another comic caricature of Mohammed, outraging many to declare, "Je ne suis pas Charlie". They consider such so-called humour to be offensive, gratuitous and completely unacceptable. And even though I don't follow any religion myself, and broadly support free speech, I felt uncomfortable to see the front-cover cartoon in the knowledge that this would - avoidably - antagonise and inflame so many, and possibly incite more violence. And yet - the most important message of today's cover of Charlie Hebdo is the one that stands above the comic caricature. The magazine boldly and some might say surprisingly stated, "Tout est pardonné" (All is forgiven). 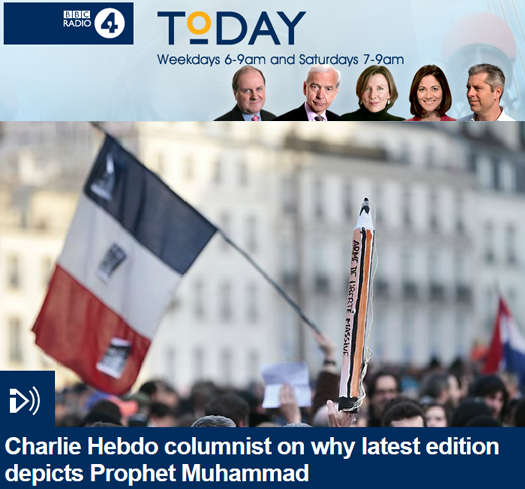 Explained Charlie Hebdo columnist, Zineb El Rhazoui, who survived because she was on holiday last week: "We feel, as Charlie Hebdo’s team, that we need to forgive the two terrorists who have killed our colleagues.” She told the BBC Radio 4 Today programme: "We know that the struggle is not with people but with an ideology". 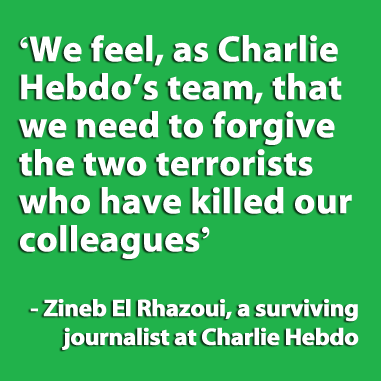 She also said, "The two terrorists who killed our colleagues, we cannot feel any hate. The mobilisation that happened in France after this horrible crime must open the door to forgiveness. Everyone must think about this forgiveness." To me, this was the most powerful, poignant and, yes, even pious message to come out of this awful, shocking event. The surviving staff of an irreverent, mocking and iconoclastic journal - within just days of their editorial colleagues being savagely slayed - are prepared to forgive those who so mercilessly trespassed against them. Isn't forgiveness a key teaching of all the religions that emanate from Abraham, including Islam? There are many verses in the Qur'an that demonstrate Islam as a religion of peace and forgiveness, and indeed most Muslims across the world are peaceful and forgiving. Indeed, forgiveness, tolerance and compassion, those are the attributes I relate to the teachings of Islam and to all the Muslims who I personally know and count as my friends. After all, in Qur'an 3:134 it is revealed that followers,"control their rage and pardon other people". 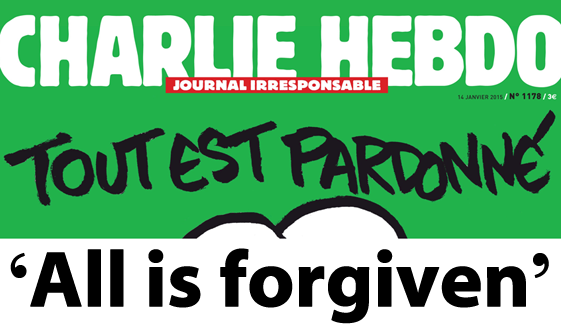 Isn't it ironic that the surviving editorial staff of Charlie Hebdo can practice and show forgiveness as taught in the Qur'an, whilst the so-called Islamic perpetrators taking such drastic revenge against them could not? Of course, we know that all religious teachings are open to interpretation, and texts from all the religions have been used by some to justify terrible atrocities against fellow humans. Fortunately, most followers of religion choose not to interpret their religious texts in this way, but there are some - more than enough - who choose a different interpretation that is causing - and has historically caused - great bloodshed across the world. Yesterday, on the New Europeans Facebook page, a commentator who chose to post under a made-up name (how brave is that?) described Islam as, "fascist and intolerant", "backward and violent" and "incompatible with Western values". He added that in Islam, "There is a stated requirement to kill apostates and well-supported hadith that encourages the killing of anyone who insults A prophet, not just THE prophet." "As a Humanist I try to make sense of the world using reason, experience and shared human values. I prefer to appeal to universal human qualities, particularly rationality, without resorting to the supernatural or alleged divine authority from religious texts. However, I am also careful not to insult religions or those who follow them. All the Abrahamic religions promote peace and compassion - that cannot be denied. But the Old Testament is one of the most violent books I have ever read. I have not read the Qur'an as widely, but it also promotes peace, as well as having violent passages just as in the Bible. Most Muslims in the world are peaceful and compassionate. Most of them choose to interpret their Qur'an as a book that promotes, endorses and compels good will to people. Unfortunately, a minority have chosen to interpret the religious texts in ways that cause great harm and suffering. That minority does not represent the views of most Muslims - just as the Catholics and Protestants who killed people with bombs in and out of Northern Ireland did not represent most Catholics and Protestants. You are choosing to highlight texts that can be interpreted in a most dangerous way. I don't think that is helpful. We have to guard against any forms of Islamophobia. This is not a war against Islam; and my advice is that we shouldn't make it one, either." During these dangerous times, all of us can help to promote the values of goodness and forgiveness. That, in my view, is the best defence and antidote against those who preach and practice revenge and retribution. In my view, you don't need to believe in God to be good; and we don't need ancient religious texts to demonstrate that forgiveness is the healthiest and happiest way for individuals and societies to live together. Fortunately, most of the ancient religious texts do teach goodness and forgiveness, and we can all look to them for guidance if we so choose. All of us have been hurt or offended by at least someone at stages in our lives. Revenge is not sweet; it's sour and poisoning. Only forgiveness can heal, and although it's difficult, and maybe sometimes seemingly impossible, only forgiveness can, eventually, release us from the pain and prison of hurt. I'd like to finish this blog with some of the wise quotes I've collected over the years about the power of forgiveness. There are many more: please feel free to add some of your own in the comments section..
"What is forgiveness? Forgiveness is a way of releasing ourselves from the pain we have experienced at the hands of others. It is a release from judgment, including our judgment of ourselves. Forgiveness is not Condemnation. Forgiveness does not mean you agree with what the other person did to you. It does not mean you can change what happened or erase what they did. What’s done is done. All you can do is release yourself. Forgiveness is Not for Them, It’s for You. Forgiveness is not something you do for someone else, but to free YOURSELF from the continuation of pain and anger. It is a gift to your peace of mind, your self esteem, your relationships with others, your future." When I hear these words, I offer the following advice: It is you that are being let off the hook. Imagine the person you cannot forgive as someone who once held a fishing pole. They've set down the pole and gone on to other things, perhaps even hurting others. In the meantime, you are still floundering in the murky waters of the past, snagged on their hook. As long as you are spending precious energy resenting, hating, and being angry, you will be unable to swim freely. What I am asking you to do it is to gently remove the hook that keeps you tangled in the past. Think of forgiveness as letting go and not having to be responsible for the other person’s accountability. I realize that means releasing the control you may feel this gives you over the person or situation, however, it is you that is truly being controlled by the refusal to let go. A very wise friend of mine (whom I’ve never met since she is a light that twinkles on the other end of the Internet somewhere) put it like this: Think of your abuser as a horse who is stepping on your foot. You stand there screaming in pain and ranting at the horse. Why not lift the horse’s leg up and take it off your foot? In that way your foot can begin to heal and you can let the horse move away from you. Forgiveness is not an easy thing for a lot of us. I believe this is because we associate forgiveness with allowing another to “get away with” whatever it is that he or she has done. If someone has done you harm, they will be accountable for their actions with or without your anguish. However seen in a new light, forgiveness can be a way of setting yourself free." 'There is nothing so bad that cannot be forgiven. Nothing! Some will argue that in the case of child abuse, the Holocaust, etc, the abuser has no "right" to forgiveness - such blessings can only be earned - that forgiveness only leads to further victimization. Such acts are heinous and despicable and with time (and in many cases, therapy) they can be forgiven. Every day you may have to forgive again. Are Past Hurts Weighing You Down? Many individuals are journeying through life with emotional and psychological "stress and strain" from a variety of past hurts. Some may have resentment or anger against a parent, relative, or friend who has "wronged" them in the past. Holding on to negative feelings and attitudes has a direct effect on your health, whether you realize it or not! Let’s see how we can re-direct our feelings about past hurts in a positive and more constructive way. A new, refreshed attitude will allow us to live the happier, healthier lives that we deserve. We are products of our life experiences and it is easy to allow past events to effect our current thoughts and feelings. Unpleasant and unfair actions by others can remain in our mind for a lifetime. People (even those that say they love us) can be mean and hurtful at times. It is not easy for many of us to forgive others, especially if we feel that we have a good reason to be upset with the other person. You have, however, a decision to make. Either you can let the weight of past hurts keep you down, or you can make a determined effort to change the situation. I suggest that you consider forgiveness as a powerful tool that can help. The ability, compassion and wisdom to forgive one another for past wrongs, hurts, and misunderstandings is one of the greatest attributes any of us can possess and exercise. Struck me as a very wise bit of sarcasm. Doreen, I shall be grateful, as I have requested privately, if you will clarify against who or what you are aiming your accusation of "sarcasm" and why. Thank you.